Compare quotes with an independent agent in the Trusted Choice network at Neely Taylor Wade Insurance who can review policies and options available from multiple insurance companies. Ask your agent about property enhancements that can lower your rates. For example, you may be able to get discounts by adding fire sprinklers to all rental units. Increase your deductibles. Rather than reducing coverage to save money, ask for a higher deductible, which will lower your premium while keeping you protected. Ask your agent whether bundling is available. Many agencies bundle multiple policy types, which can reduce your premiums. Not all will bundle business insurance policies with personal policies. Keep your property well-maintained to avoid risks to your renters and to your property. 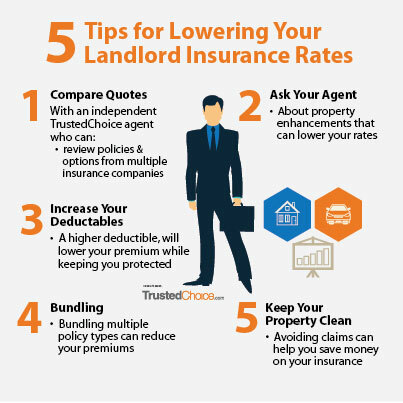 Avoiding claims in the first place can potentially help you save money on your landlord insurance. For more information, see this Landlord Insurance Deals page from our partners at Trusted Choice.